This day marked the end of the first leg of our journey in Israel. We woke up early, bags packed, and lined up on the curb like children waiting to board the school bus for their first day of class. We ate our last breakfast at Nof Ginosaur and watched the waves lap on the beach, our last sight of the Sea of Galilee. It was a sad and exciting moment to leave behind the place we had called home for the last three days in order to branch out and find a new home in Israel. We had one stop on the way before out final destination for the day could be reached; we had eight new members to pick up and join our merry crew. 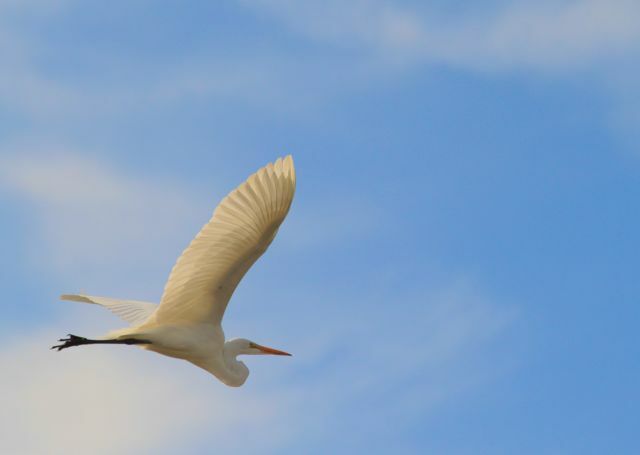 Everyone knew that at some point in the trip we would be joined by eight Israeli soldiers who would accompany us on our trip to give us a little taste of what life is like in Israel for people our age. They were not coming to protect or guard us, they were coming to be our friends and peers. At first I was a little wary of this, I wasn’t sure what it would be like, whether we would get along, or whether we would really connect at all. What I didn’t know was how much I was going to miss them by the time they left, or how much I miss them still. I never expected to grow so close to people whom I had gotten to know in the span of five days, but I do. We picked them up at Modin, a modern booming city that is rapidly expanding. At a bus stop around the corner from where we parked, our newest friends waited for us. Full uniforms and army bags, they came onto our bus and very quickly changed our entire experience. We all tried to welcome them as much as possible and talk with them. We only where with them for a few short minutes when we went to our first stop of the day, an Eco-Farm that is entirely sustainable and zero waste. Everything here is grown and nothing is thrown away. We stopped in this green little oasis full of rows of farming and little huts where people lived. We toured all over the place and even got to make some homemade pita bread on an open fire. We had some free time so we all wandered around the farm by ourselves and could check anything out that we wanted to see. I wandered off to go to the recycling tent where people leave belongings they no longer want so that others may utilize them as they desire. The tent was dark and not lit but it was in this room where the lives of people where left behind when people grew tired of their old hobbies or old books. A tent full of things brought from all over the world and later no longer desired or useful. I leafed through the discarded books and found a copy of a Nadine Gordimer short story collection that I tucked away and took away with me. A little piece of literature that had been abandoned in Israel, picked up and brought to a new home across the world. When we left the farm our conversations with the soldiers really began. Our first real experience with them was trying to play musical chairs… on a moving bus. As everyone ran around laughing our bus driver was yelling at us in Hebrew and it was so much fun but a little dangerous. 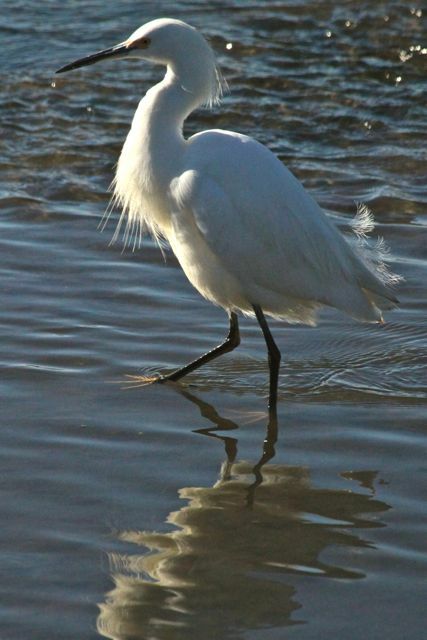 As we were playing we began to hit windy roads which marked the changing of our surroundings. When we finally found our places again we looked out our windows where there were no rolling green hills any more, instead they had been replaced with deep desert valleys and sand dunes. Scene after scene of desert barren lands brushed by our bus windows for about an hour before we found ourselves descending into a valley surrounded by sand dunes. As we did we could see all sorts of little villages that we were told were from refugees and illegal immigrants who had set up settlements in the desert. Children sat on sand dunes and wild dogs roamed the desert, watching as we went by in our air-conditioned bus. It was an odd unsettling feeling that provoked the ever present feeling that maybe things are not as fair as we wish they could be. We made our way down winding desert roads to a small oasis surrounded by palms. 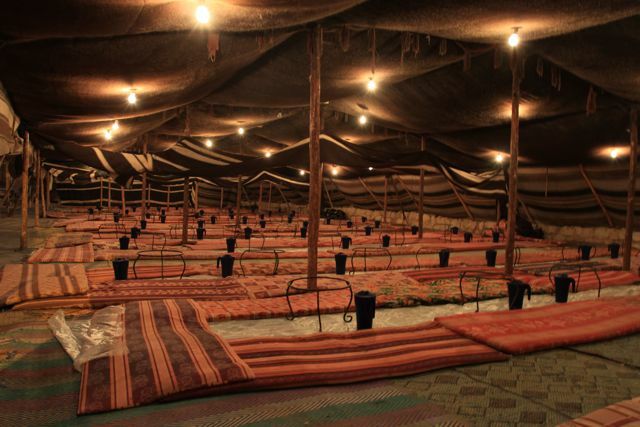 This would be our station for the night, the Bedouin encampment in the middle of the desert. As our bus pulled in we looked at the stables of camels and donkeys on the outskirts of the encampment that were fenced in with giant tree trunks of palms. We dragged all of our luggage from the bus and left it aside for later. 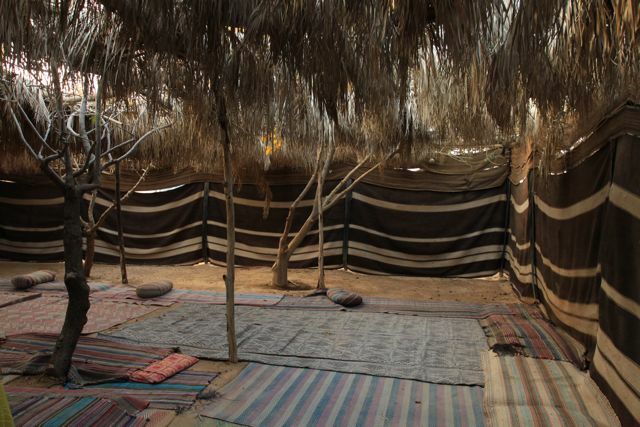 We had our introduction to the Bedouin experience in a goat hair tent roofed with palm leaves. 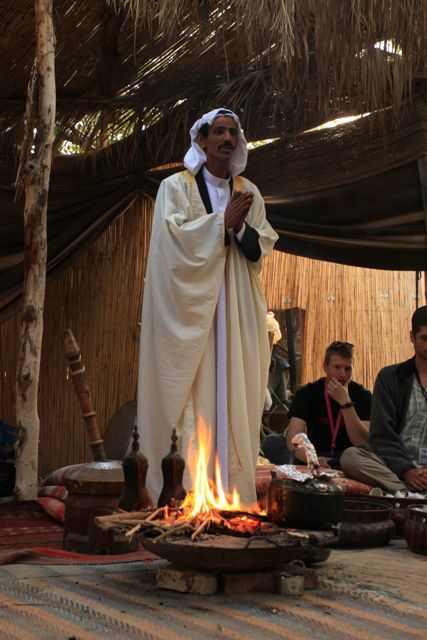 Standing above a fragranced fire, we were told about what it meant to be a bedouin. The wandering nomadic lifestyle that was lived by these extremely hospitable people who lived out in the desert in places somewhat like this. The entire time though we were all painfully aware that this “Bedouin Experience” we were able to take part in was at its very foundation nothing like real Bedouin life. This was a comfy tourist “resort” that aimed at a genuine experience of Bedouin life that could never really get close to the way these people live their lives. Hospitality and generosity towards visitors was highly important. As we sat listening attentively on the floor we were served tea that was made on the fire right before us. It was probably the best and most interesting tasting tea I had ever been lucky enough to taste. It was also really welcomed because at this point I was getting really sick and my sore throat was killing me. I had basically entirely lost my voice, so to have some hot tea was soothing in the best ways possible. After our introduction to our Bedouin Experience, we went back out to the front of the encampment where we had previously seen the camels and donkeys. 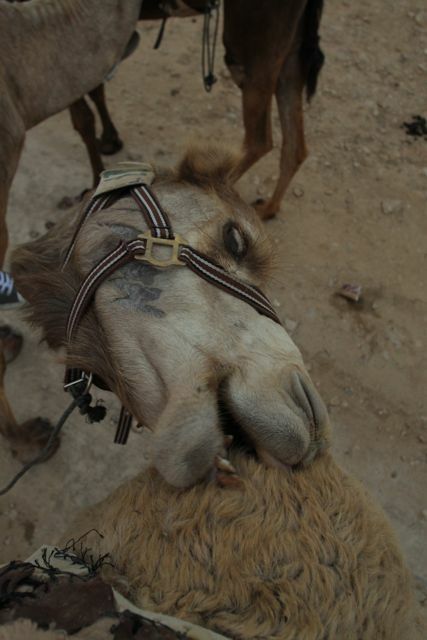 I got camel number 47; a wily, dusty creature that seemed none too pleased to have something sitting on top of it. As I was perched atop the seated camel I was looking about taking pictures with my camera which I held uplifted in one hand and my other I used to hold the harness on the camel. I was extremely unprepared when our guide smacked the camel and it stood up, but not all the way up mind you, just halfway. So I found myself suddenly sitting at a forty-five degree angle with only one hand to brace me for the sudden jolt. 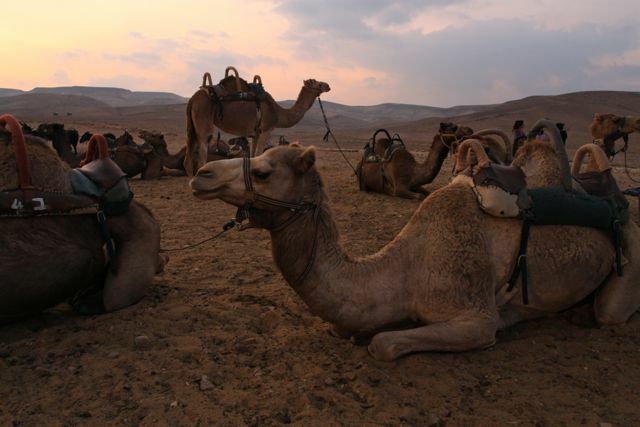 I was nearly tossed over my camel’s head as it remained happily only halfway up with its back legs straightened and its front still neatly folded underneath him. 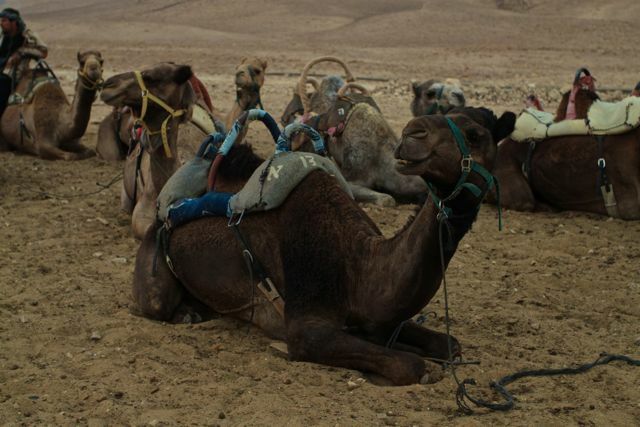 After nearly being tossed within five minutes of sitting on my camel, it finally stood up and I was able to experience what it felt like to ride one of these ships of the desert. Not another five minutes went by before he tried to bite me. It really didn’t like me and I can’t say I was too pleased with him either. Keep in mind, I am afraid of horses, little did I know how much scarier these swaying creatures of the desert where than horses. After a rough start we all lined up and headed out into the desert at sunset. The swaying steps of the camels really do make their nicknames, “ships of the desert” seem extremely accurate. We were led out into the rocky desert hills near where we would be staying for the night as the sky slowly turned pink. The horizon seemed to be lit on fire and the stones cast shadows around us as we made our way into the desert. 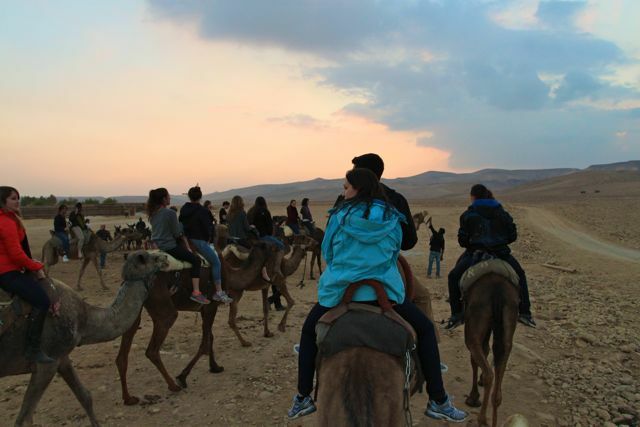 I forgot to mention that only half of the group was on camels, the other half got to ride small donkeys. The plan was to switch halfway through so everyone had a turn on a camel. Let me just say, things didn’t go as planned. Within ten minutes of our journey into the desert, which, by the way, was not a long journey, half of the people on the donkeys had been bucked from their backs. 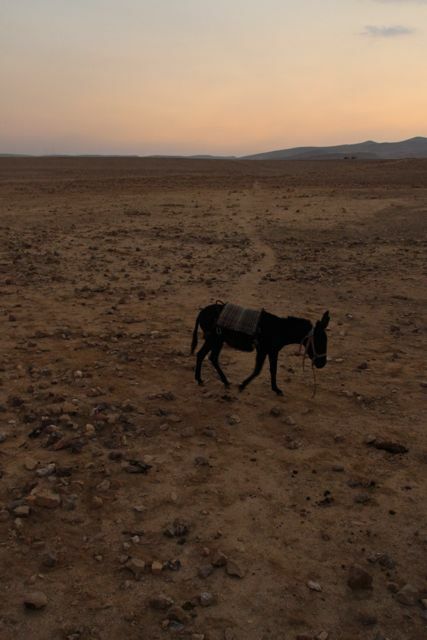 The donkeys went crazy and after ridding themselves of their burdens decided to wander off into the desert alone. After the difficultly with the donkeys, which were significantly smaller, those who were on the donkeys decided that the much larger and scarier camels where not worth the effort if the donkeys had been this difficult. 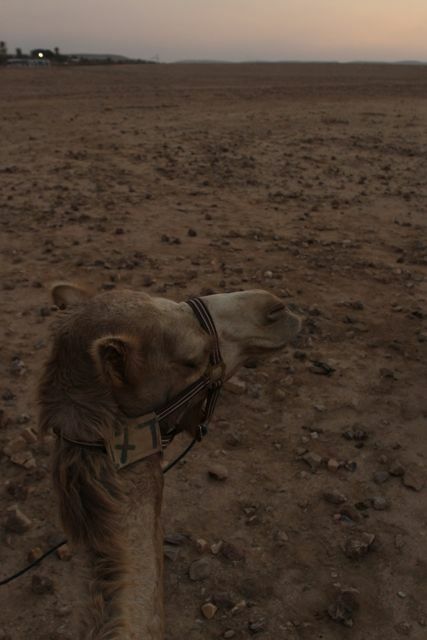 So I got to remain on my perch high above the desert floor as my camel swayed its way across the desert floor. As for the others, they decided to walk. The donkeys went their own way and wandered free of their burden off into the sunset. Our time out in the desert was not very long at all but it was still a great experience to ride a camel into the sunset and watch the pink tint of the sun touch the desert hills. It is nice to say I have done it, but I don’t think I would ever do it again. 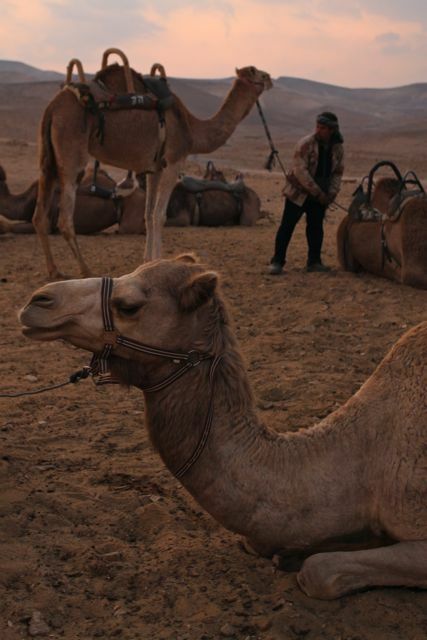 So I will leave the camels to the desert and the tourists still seeking the allure of a specifically tourist crafted experience that really only means something to them. 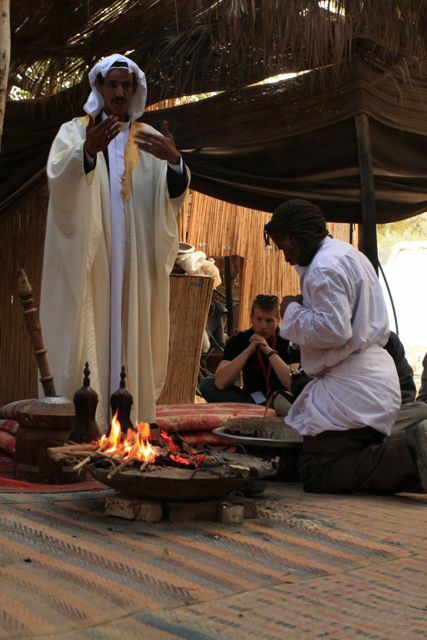 We returned to the encampment for dinner inside the bedouin tents. Mats were laid out everywhere with stands that would later hold our food. We each sat at tables with about four other people and had what felt like private little dinners in a giant tent filled with masses of people. It was a lot of fun getting to know everyone over an amazing bedouin feast. After dinner we had free time for the rest of the night which resulted in a guitar and mandolin jam session until about three in the morning. 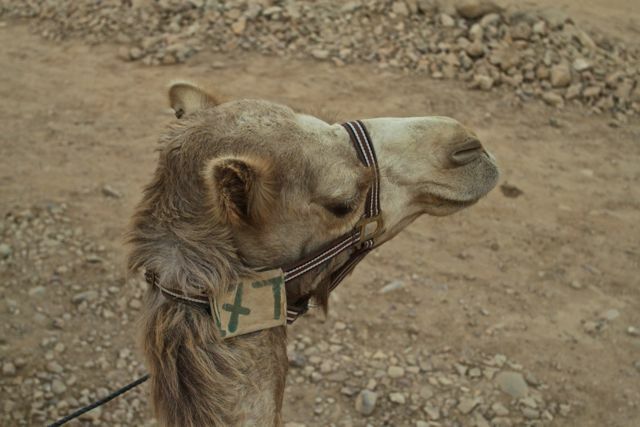 Before that though, we had one little excursion to end our bedouin experience out in the desert. It was easily the most meaningful experience I had the entire trip. Once it got really dark out and dinner had finished we all wandered out into the desert in a giant group. In near silence we headed out into the dark; blind in the utter darkness without a single shred of light, since the moon was not up. Those with flashlights were clung to like bats by the others trying to use any bit of light to see the rough desert terrain we were traversing. I was one of those with a flashlight and my companion was my friend Plia who was one of the Israeli soldiers who had joined us. I talked with her as we walked about the stars in the night that seemed to be the only thing we could see clearly in the dark. We had a great conversation breathed in hushed tones as we walked through the desert. Finally we made our way deep enough into the desert to lose sight of the lights from the encampment (but sadly not far away enough to lose the sound of tacky music being blasted from a party that was happening back where we were staying). So in (almost) complete silence, we individually found places in the dark to sit and just contemplate life, think about the trip so far, and wonder at the beauty of the desert. Plia and I sat together and lay down on our backs, even with rocks digging into our spines, and peacefully watched the stars. I pointed our constellations to her as we lay there talking. To both of our utter surprise as I was pointing out a constellation a shooting star shot across the sky right where I had been pointing. It was such a movie perfect moment, neither of us really seemed to believe it had happened. We both just turned to each other in the dark and smiled, our eyes asking each other where we had both just seen that actually happen. I can’t explain how much that little moment filled my heart with a warmth and happiness that seemed unbounded. We split up to have quiet time and I saw yet another shooting star by myself later as I sat looking up at the sky and the desert that was bathed in a deep blue that I feel can only be found in the darkest, deepest parts of the sea. There was truly something magical about just sitting out in the desert near midnight in utter silence. This sand, these rocks, these stars, had seen a history on this soil that I couldn’t even begin to imagine. IT was here, out in this desert that Jacob wrestled with God, here out in this desert that thousands of years of history had unfolded. Even though all we could see was the darkness and the hardly lit landscape before us, that space was not empty, it was full to the brim. It was overwhelming to sit under the canopy of heaven and feel like the stars where so close that they were bending the sky in an effort to reach out and touch you. Never have I felt such a connection to the land before; it was enough to bring tears to my eyes. After our quite time we all where summoned back together by our group leader Itay playing the guitar and singing a Neguin wordless song of praise. It seemed to resonate in the desert and as we all slowly got back together, everyone seemed to know that everything had changed. Everyone had felt something amazing in those moments, each in their own special way. We all gathered together and made a huge huddle around Itay and we sang out in the desert together. Our voices breaking the silence and reaching out across the land. We sang in Hebrew, we sang wordless songs, and eventually worked our way to cheesy American pop music. It was a wonderful progression from the serious and contemplative time we had had, back into a fun and carefree enjoyment of one another’s company. We sang out in the desert at the top of our voices to American Pie, Brittany Spears, and many other songs. With the lighthearted end to our desert quiet time we returned to the encampment renewed and with hearts filled with our experiences. Back at our tents we continued the lighthearted singing in a jam session. It was so much fun to just stay up all night, singing, having deep conversations, and really getting to know each other besides the normal introductory questions we had been building our friendships upon. It was a night I will never forget. 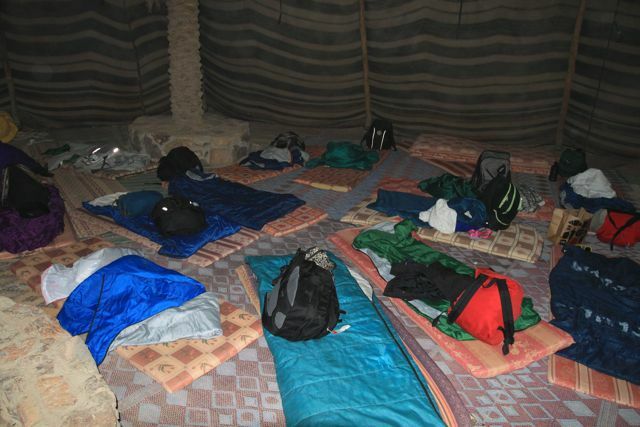 We slept on the floor of a giant goat skin tent in sleeping bags for only a few short hours. The next morning was a six am wake up call and a long day ahead. It was a bittersweet end to the night; such a great time staying up with everyone, but the lack of sleep that followed would come back to bite me for the rest of the trip.